Greenbriar Picture Shows: Get Out Those Stereo Specs! Get Out Those Stereo Specs! A big wind is blowing from 3-D headquarters that is Bob Furmanek and associates. They've plunged to deepest depths of the stereo process and come back with Rarities beyond rare, most in fact unseen since they were new, not a few barely exhibited then. I call it a miracle such stuff survives, but leave it to Furmanek, restoration genius Greg Kintz, and Associate Producer Jack Theakston to do the impossible in bringing these treasures to collector doors. Greenbriar is on project fringe in "Executive Producer" capacity, which amounts to co-sponsorship from afar, and not creative or technical participation (I wouldn't begin to understand labyrinth that is 3-D/Blu-Ray mastering). There are stereo novelties in 3-D Rarities too numerous to recount, dating from the silent era, and forward to the 60's. Amazing subjects all, many snatched from edge of oblivion, each reborn to digital perfection. One thing we're assured whenever this team goes to work, and that's result second to none where presentation is concerned. They've Blue-Rayed several 3-D features, have more in the works (Gog and The Mask are coming! ), research and progress documented at 3-D Archives, that trove of depth history that is updated often (just today, in fact, with "Silver Age 1966-1988" coverage). 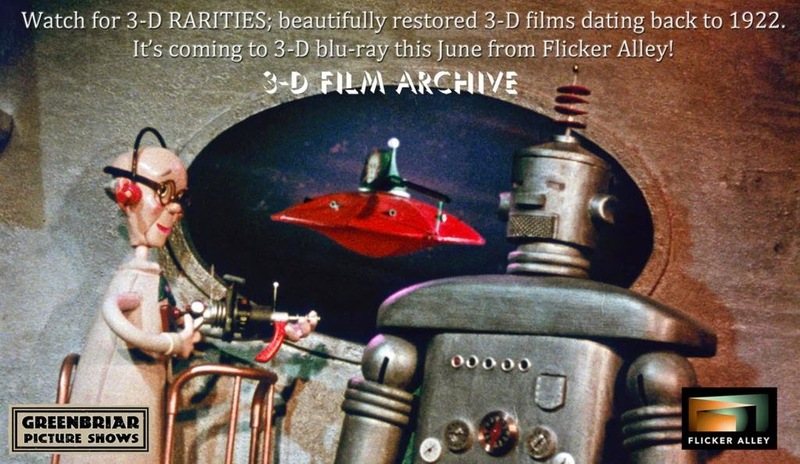 Blu-Ray lift-off for 3-D Rarities is June 23, discounted pre-orders now available at Flicker Alley. There are theatrical premieres in the meantime, one in L.A., another at New York's Museum Of Modern Art on June 13, the latter which GPS will attend. 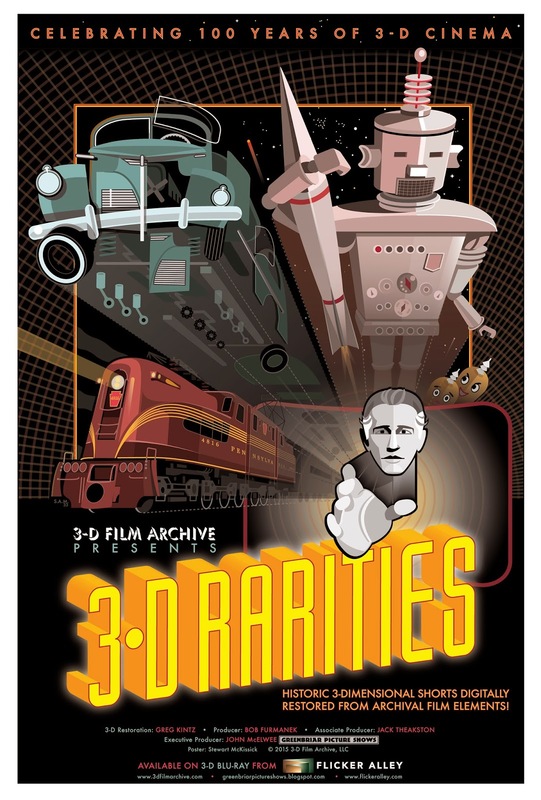 Should be a thrill, as they're showing the 3-D Hondo in addition to 3-D Rarities. Is there any possibility that they might show these in Columbus Ohio Memorial day weekend @ Cinefest? The premiere has been set for MOMA on June 13, so it's doubtful that the films would be shown prior to that. Does one need a 3D TV to watch this, or would a regular TV work? My heartfelt thanks and appreciation for your invaluable assistance on this project, John. I'm glad to see this is being done. Don't know why, exactly. I don't have a 3D television and have absolutely no plans to buy one. Still glad to see it, though. Get the Peter Wimmer Stereoplayer (http://www.3dtv.at/Products/Index_en.aspx). It is one of the best investments I have made. It is constantly upgraded. It gives the option of seeing digital 3D in a plethora of formats (for those without a 3D TV)including anaglyph (red and blue, yellow and blue, green and magengta, red and cyan. From the site: Stereoscopic Player is a versatile 3D movie player. It allows you to play stereo­scopic videos and DVDs (external decoder required) and also allows you to watch live video from a capture device. Since it is based on Direct­Show, it can handle almost any media format, for example AVI, MPEG, WMV, ASF and MOV. Videos can be coded in several different stereo­scopic formats. Please see the feature list for supported input and output formats. Why is it necessary to use a special software for 3D movie playback? The reason is that there are a lots of different ways to watch stereoscopic content as well as different ways to store the content. In the past, it was necessary to encode a stereoscopic movie for each viewing method, for example you had to create an anaglyph file, a interlaced file for use with shutter glasses and a side-by-side for for free-viewing without glasses. Quality was often low. For example, most video codecs don't handle interlaced content well or subsample color information (reducing color resolution to quarter of original resolution), which reduces anaglyph quality significantly.The solution to above problem is creating just one file and convert it in real-time to the desired output format. The Stereoscopic Player is such a real-time conversion application. Using the player is easy: Load your stereoscopic movie, tell the player how it is encoded and finally select the desired output format (called viewing method). For your convenience, the Stereoscopic Player remembers input settings for each stereoscopic movie in its integrated video library so that you don't have to re-do all the configuration steps again and again. For the most popular 3D-DVDs and 3D video files, Stereoscopic Player can even retrieve the proper settings from a web server. If you are creating content yourself, you can ship your video files together with a Stereoscopic Metafile (*.svi), which also eliminates the need to specify the input format. For professional use, command line parameters, OLE automation and the Sony 9-pin protocol are available to automate the Stereoscopic Player. Furthermore, it can control external effects via a serial port or DMX512. It severely diminishes the visual quality of the image. After all the work that has been done to restore these films, we don't want to present them in such a compromised state. With the exception of one burlesque short and the pre-1935 footage, everything in the set was originally shown theatrically in polarized 3-D. To convert them to anaglyph would not be historically accurate. I'd like to see everyone get the Blu-rays Bob Furmanek produces (or has a hand in). If you do not have a 3D TV (I don't. I use digital big screen projection and it is wonderful) the Peter Wimmer Stereo Player can help you until you do. Down the road these may not be available later. Get them while you can. And get at the people who own the rights to films like BWANA DEVIL, SADIE THOMPSON and so many more to get them out there.